to your photos in a batch. 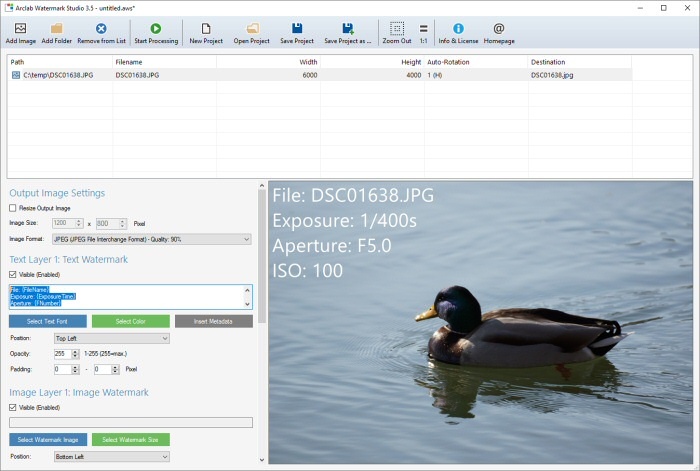 Arclab Watermark Studio allows you to add a visible text watermark with EXIF Metadata, like e.g. Aperture, Exposure Time, ISO Speed, GPS, etc. to your photos. You can combine multiple metadata values to a text watermark. The position of the watermark, text font, text color and text size can be freely defined. Click on "Insert Metadata" to show a list of all available metadata placeholders and the corresponding meta values for the currently selected image. You can combine the placeholder(s) with custom text. Please note that - depending on your camera - some EXIF metadata values might not be available!